Soundwave over for another year and I can’t quite believe how much it hurts. Even during the festival I started to notice it, with my back getting sore from carrying a camera bag weighing more than 10kg and my arms feeling increasingly tired from holding a camera pointed at events happening on stages across the festival site throughout the day. By the time I got back home I didn’t have the energy to much at all, an early night being the only thing I was any good for rather than working late on starting to edit photos. Waking up the following morning brings a whole new world of pain; everything hurts. As I’ve done for this year’s Big Day Out and Laneway, I set the GPS tracker on my mobile going to record my movements over the day. There were problems getting a GPS signal at the start of the day, despite being stood in the middle of a field, and my battery died during photographing Slipknot, with more than 2 1/2 hours of the festival to go and another five bands to be photographed at different stages around the site. With my mobile having died I also had to walk over a kilometre home from the train station rather than calling up to get picked up when I got back. Missing more than 2 1/2 hours and walking from Slipknot at Stage 2 to The Used at Stage 3 to Cro-Mags at Stage 6 to System Of A Down on Stage 1 to Watain at Stage 4 (Lamb Of God were running late) and finally to Stage 7 for Sisters Of Mercy would have added on a fair number of extra kilometres and with the walk from the train I would have thought that it would have been another 15km+ festival day out. 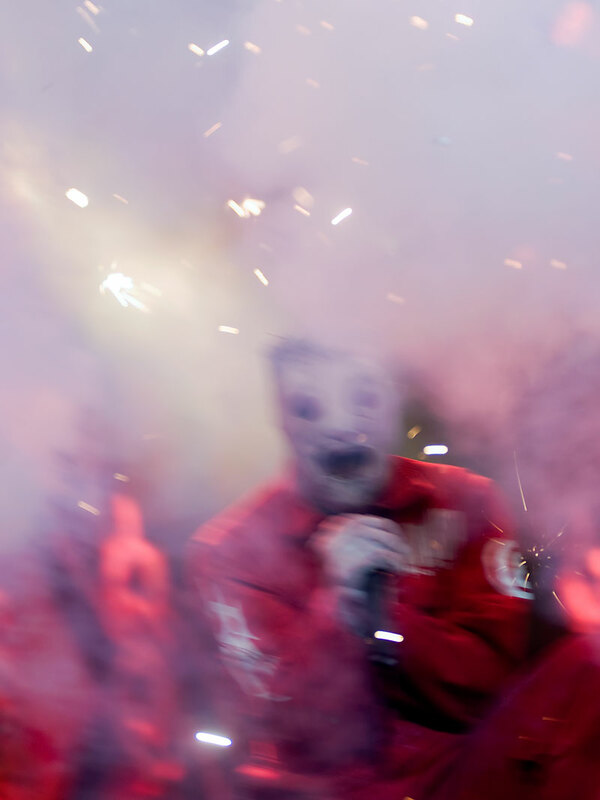 Photographic highlight of the day was getting to photograph Slipknot, which was a whole bunch of fun. Steel Panther were as well and The Dillinger Escape Plan were fantastic but played in the dark, leaving me wishing I had a better set of photos of the complete mayhem that took place during their set. I also really enjoyed Thursday, although sadly a bit too late given the band have previously announced their split at the end of this Soundwave tour. The photo at the top of this post was from the start of Slipknot’s set. There was a explosion, which, even with the benefit of earplugs, was completely deafening, as well as leaving all the photographers in the photo pit seeing nothing but white for a couple of seconds after. It happened just as I pressed the shutter button to take this photo. System Of A Down, the festival’s headline act were boring, as well as ambushing us with a last minute photographic contract that we all had to read and sign in the darkness of the photo pit minutes before they were due to start. It wasn’t the only contract of the day though, with the main festival contract including a clause that not only would there be no pit access, but Marilyn Manson and Limp Bizkit “requested” that you didn’t take photos of them from outside the pit. It was an interesting use of the word “request” as the clause continued on to say that if you were caught photographing either act you’d forfeit your photo pass and be removed from the festival site. In the end I didn’t bother to stop to see either acts but it was disappointing as I had been looking forward to photographing them, and especially Marilyn Manson, even though I’m probably about 15 years too late to do it. There’s a bunch of my photos from the day over at The Vine and I’ll try and get around to putting up some more posts here in due course. This entry was posted on Monday, February 27th, 2012 at 9:23 am. It is filed under Music Photography and tagged with Brisbane, Dillinger Escape Plan, Festival, metal, Music Photography, punk, RNA Showgrounds, Soundwave, Soundwave2012, Steel Panther, System Of A Down, Thursday. You can follow any responses to this entry through the RSS 2.0 feed.